The coolest urban sporting & social event the Heineken Urban Polo is back and will be taking place on the infield of Ellerslie racecourse in Auckland and Hagley Park in Christchurch this summer. 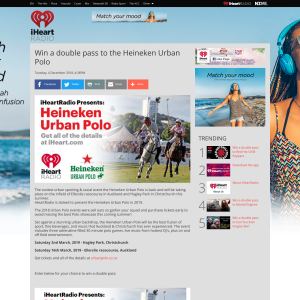 iHeartRadio is stoked to present the Heineken Urban Polo in 2019. The 2018 Urban Polo events were sell outs so gather your squad and purchase tickets early to avoid missing the best Polo showcase this coming summer! Set against a stunning urban backdrop, the Heineken Urban Polo will be the best fusion of sport, fine beverages, and music that Auckland & Christchurch has ever experienced. The event includes three adrenaline-filled 30 minute polo games, live music from hottest DJ's, plus on and off field entertainment. 4. This competition closes on the 10 February 11.59pm. Winner to be notified via phone.